It’s been several weeks since the last update, and I really was hoping the next update would be a running engine. Unfortunately I had a setback on that, which I will get into shortly. This one is going to be a double update! First up is that the engine and chassis painted up very nicely. I painted the engine and each of the disassembled chassis sections separately, and then again after having them re-assembled. This allowed me to get better coverage on each section, and then the additional coats after assembly took care of the scratches from re-assembly that are bound to happen. The cherry picker / hydraulic shop crane has proven invaluable for this project. Besides the normal engine pulling / installation, I have been able to use heavy ratchet straps to sling larger assembly’s like the entire front end loader and the front axle / chassis sub-frame. With careful control of each ratchet strap, I was able to pitch the assembly just how I needed and then line up the frame bolt holes for assembly completely by myself. Even with the aid of several big guys, I do not think that could have been done very easily without it! Once the engine and chassis were all bolted back up, I wanted to test fire the engine before assembling it any further. I hooked up the minimum connections needed in order to get fuel to the injection pump, and power to the glow plugs and starter. I did not have the radiator installed yet, so I would only be able to run the engine briefly. I also had a scrap piece of wood handy to suffocate the intake with, just in case I did not get all the governor springs inside the injection pump reinstalled correctly. I bled the air out of each of the injection lines, energized the glow plugs, and cranked it over. Sadly it wouldn’t start. I gave it several attempts and re-bled the injector lines just in case they still had too much air. Eventually I gave up for that night. Later I took the injectors back out for a compression test. I was seeing compression of about 200 psi on #1 and #3, and only 90 psi for cylinder #2. I double checked the valves were adjusted correctly, as that can also give low compression, but all was good there. I began to suspect the head was cracked from overheating. I know the engine had a history of overheating before it was taken out of service 9 years ago, and likely ran without coolant on at least one occasion due to the cracked T-stat housing I found. When I had it apart, the cylinder head was warped (about 8 thousands out). I was able to re-surface it myself following YouTube videos, and brought back to within 2 thousands of being flat, which is the workshop manual spec. I also lapped the valves, and was not able to visually see any cracks at that time. 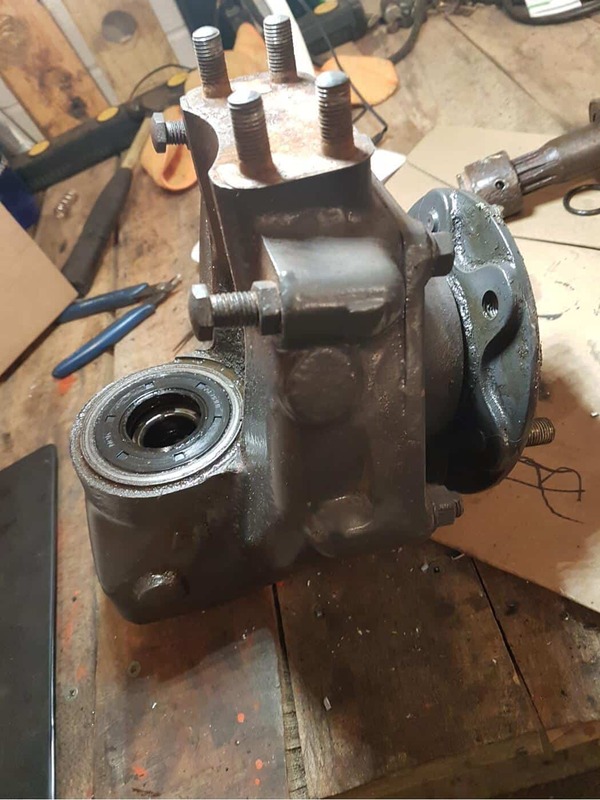 It did not really make sense to have it sent into a shop to be magnafluxed, as the #2 cylinder was pretty eroded, and these heads are cheap enough that if it was cracked a new head from eBay would likely be the same cost or less than repair work on the head. Given that, and the eroded #2 head area, it would not make sense to spend a lot of money repairing this head. But since I didn’t see any cracks at the time, I was willing to invest in a head gasket to give it a shot. Later after it was all assembled and I had painted the engine, I noticed a crack on the external surface of the head. It appeared to be only in the water jacket area, so I put epoxy on it and tried to forget it was there to ease my mind! But now that my compression is low, the most obvious answer is there were additional cracks that I had not seen. The good news is I was able to pull the head fairly quickly, without needing to remove the entire engine again. Wow Mark, you are really inspiring me to do this type of restoration on my tractor someday, you are tenacious! Bummer on the head, I ran into a similar issue with a Rabbit diesel years ago where the #2 and 3 cylinders were leaking due to a warped head. Good luck on sourcing the replacement head, once done I’m sure you will have a busy summer sitting on top this tractor! These B20’s are little beasts, I really like having the 4WD to pull in when needed. Your Chassis work looks awesome! Thanks Tom! It has been taking longer than I hoped, but over all its been an enjoyable project. I find its easy to get intimidated with bigger projects like this, but when you take it one step at a time they are not that bad. 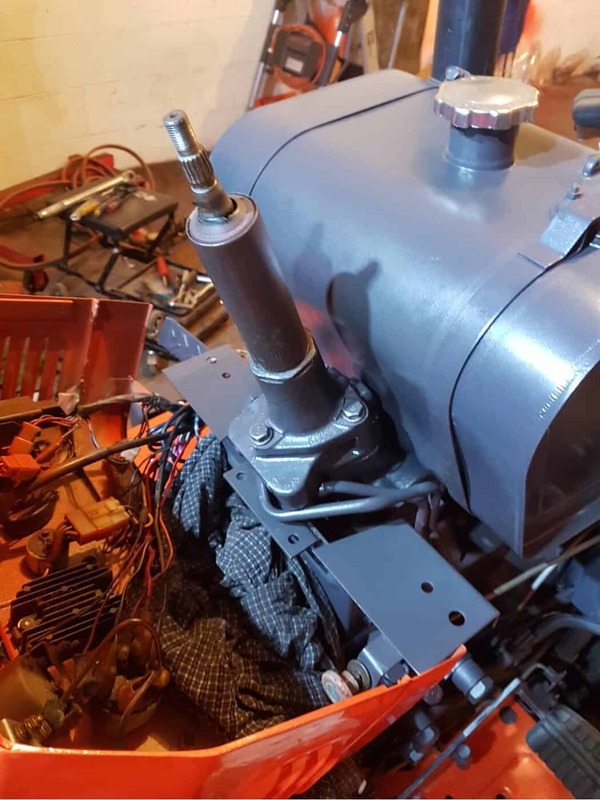 You are right, there are no shortage of projects around here, and several of them I have been putting off because I want to use the front end loader when I tackle them! I stripped the old head and cleaned it back up for a second inspection. I used a brighter light and a magnifying glass this time. I did find there are at least two cracks in the combustion area, between the valve seats and web to the recessed combustion chamber. Here is a full shot of the head, and even knowing where to look in the photo, I can’t see the cracks. 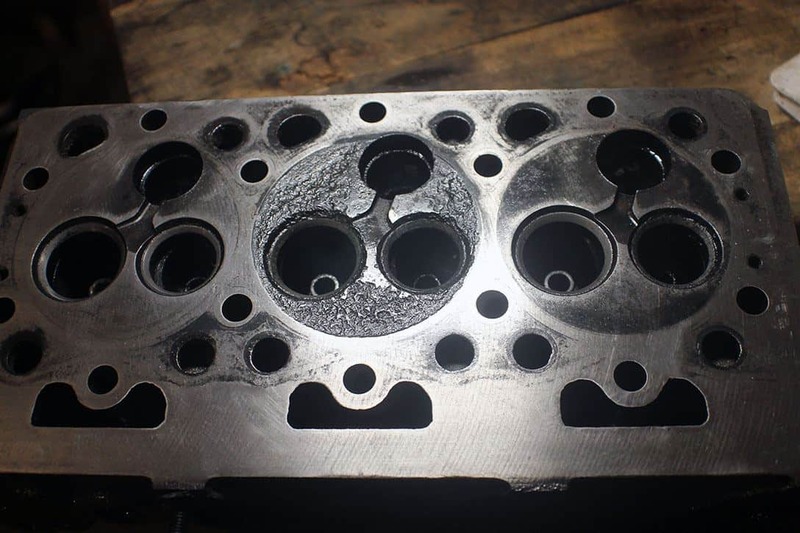 You can see the large pitting / erosion of the #2 cylinder though, which is why I didn’t want to invest in any machine shop work for this head. Here is where I epoxied the external crack I had mentioned in the previous post. This is the first internal crack I found. It runs well into the valve recess, across the hardened valve seat, along the lower corner of the valley and down into the recessed combustion chamber. This one actually shows a little better in the photo than it does in person. The camera flash must catch it well. I also discovered this one as well. It crosses the valve seat, and then continues straight into the valley between the ports. It’s harder to see, but its there. I have purchased some penetrating dye and developer to make finding these kinds of issues at home much easier in the future. I may test it out on this scrap head when it comes in just to see what else shows up! In the mean time I have ordered a Kumar Bros aftermarket replacement head for this engine. The reviews I could find were mostly positive, and it is quite a bit less expensive than a genuine Kubota one. Hopefully the next update will be a running engine! Great work. I found this forum looking for info on changing out my radiator hose and your post came up. I got my B20 from an old concrete contractor that I know. He was not sure how may times it had turned over before he got it, or how many times it had since he got it. It has substantial wear all the way around, but suits it’s purpose on our little farm. I traded some work with an equipment mechanic and fabricator to have my bucket levers and the backhoe levers fixed because they were extremely soppy. He did awesome work and redesigned the mount for all the levers. I will try to figure out how to load some pictures later. The more I use my tractor and backhoe the more I appreciate how tough it really is for it’s size. Mine is getting tired and needs quite a few things done. Seeing you tackle these projects helps to encourage me to do it…maybe this year. Thanks for sharing. Glad I found you post about the B20 restoration. Looks like it’s been a year since the last post. I’m wondering, are you still working on this tractor? The reason I ask, I have a B2150 and the backhoe (BT750) that was installed on the B20. 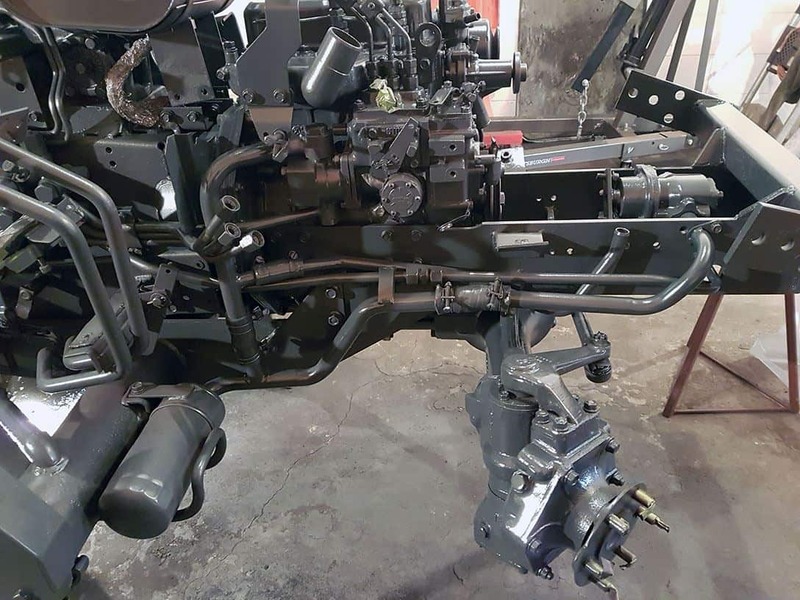 I’ve been searching for a sub-frame from a B20 in order the mount the backhoe on my B2150, which uses the same rear transaxle and lift arm housing as the B20. 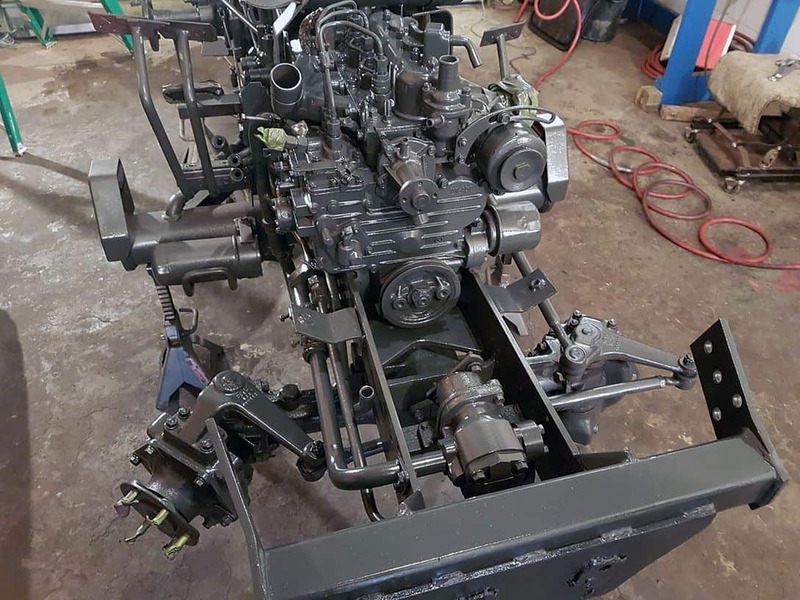 I’d be willing to pay for it and swap you the heavy-duty drawbar and brackets the came stock on the tractors without a backhoe, like my B2150. Hi Mike, the last post was about a month ago. The new head has arrived but the valves all leaked so I am currently fixing that between other work. I do nto want to sell the sub-frame as I hope to get a backhoe attachment myself. If you ever decide to just use a standard 3 point back hoe attachment, let me know. I would be interested in buying the BT750 from you. Hi, nice job. I have a B20 also which caught on fire. 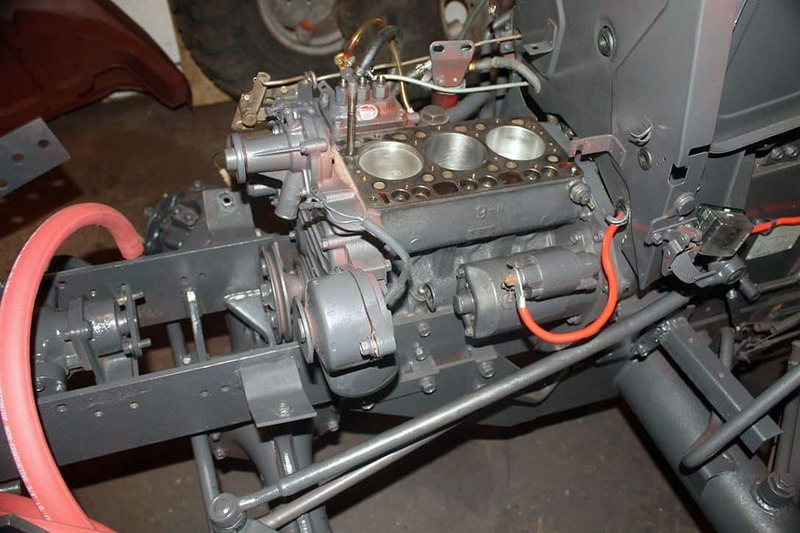 I am in need of the Gauge panel and the rubber gasket that goes around the sterring column. 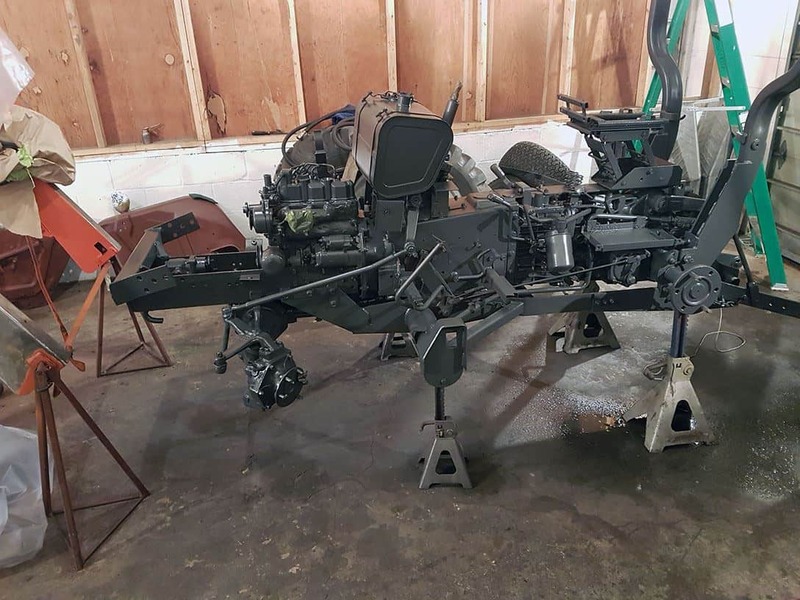 If anybody has a Kubota B20 for parts…. My phone is 253-376-3860. Thank you. 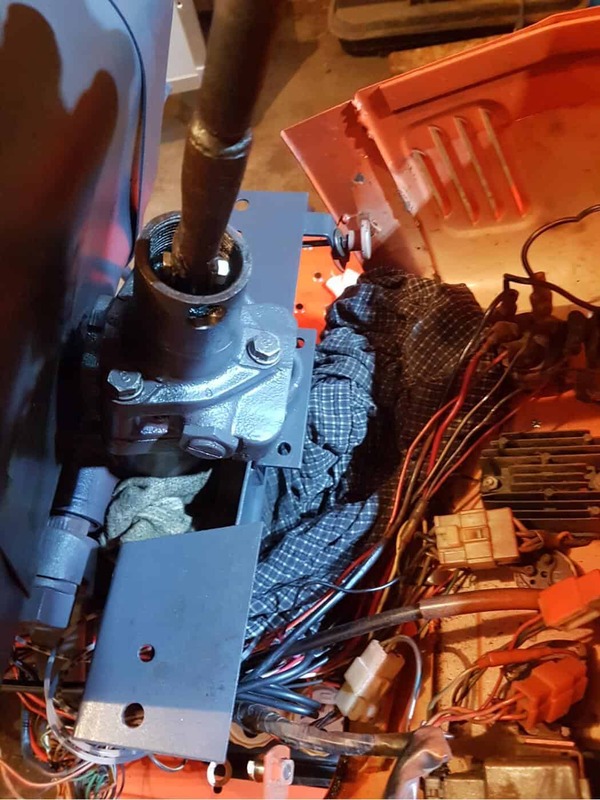 Also talk about some of the remaining issues that still need addressed in the steering column, and the front gear case on the left side wheel. This reply was modified 1 year, 6 months ago by Mark. Congratulations Marck, crowning your effort, thank you for sharing. Here in Peru repairing the engine of an equal. We hope to end it like yours. One question for you, what did you use for a repair manual? I see the WSM workshop repair manual on ebay for ~$90. I don’t mind spending that but I would prefer to get a recommendation first. 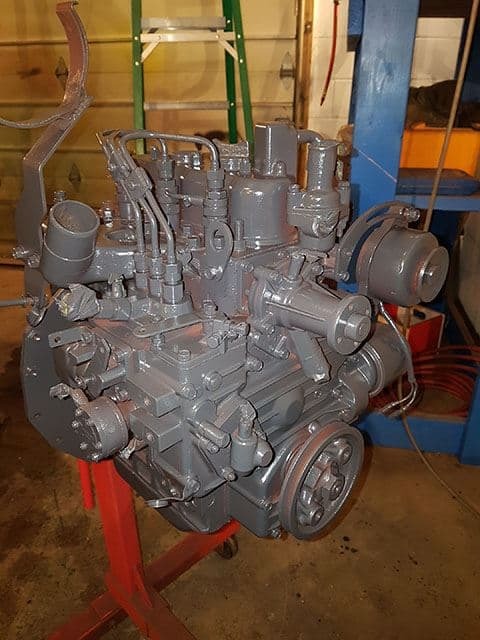 I am close to an engine rebuild and will need something to guide me through the process. Thanks for the tire recommendation Jason. Those look like a good option, and may give them a try. I was given an old workshop manual with the tractor. It is helpful, though not nearly as thorough as other workshop manuals I have used. It definitely helps though. It gives an overview of all the major systems, give the full separation process, and then tear-down / re-assembly of each major assembly. Torque specs are listed. There are photos and diagrams as well, but they are so fuzzy it is hard to make out any detail on things sometimes. I have repaired both of the issues discovered during the engine break-in video. 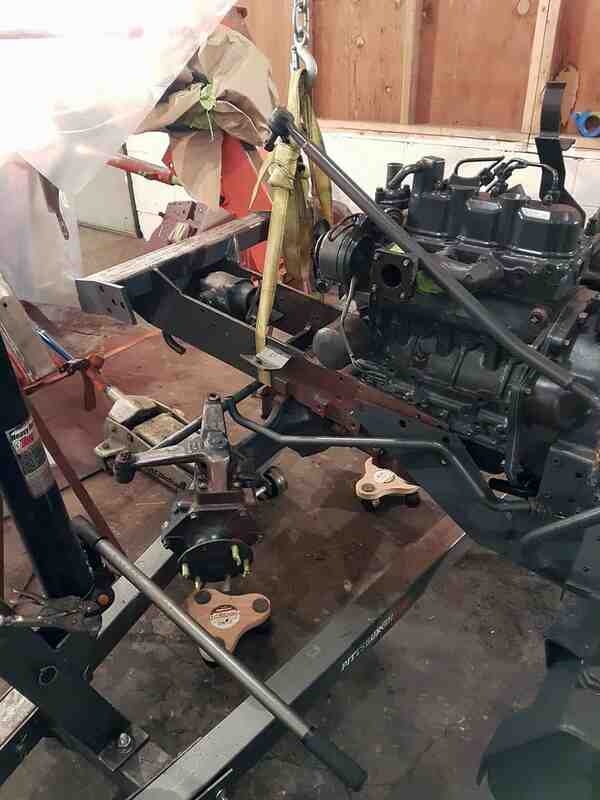 The steering column had way to much play and lifting up on the steering wheel cause it to pop out of place, and the front axle had a major oil leak at the front left hub. The repair to the steering was much more difficult than I had expected! Instead of being a broken shear-pin like I had hoped, it turned out the input shaft to the power steering box had broken instead of the pin. It was amazing I had any steering at all! A replacement power steering box from Kubota was over $600, and I didn’t see any used ones available online. 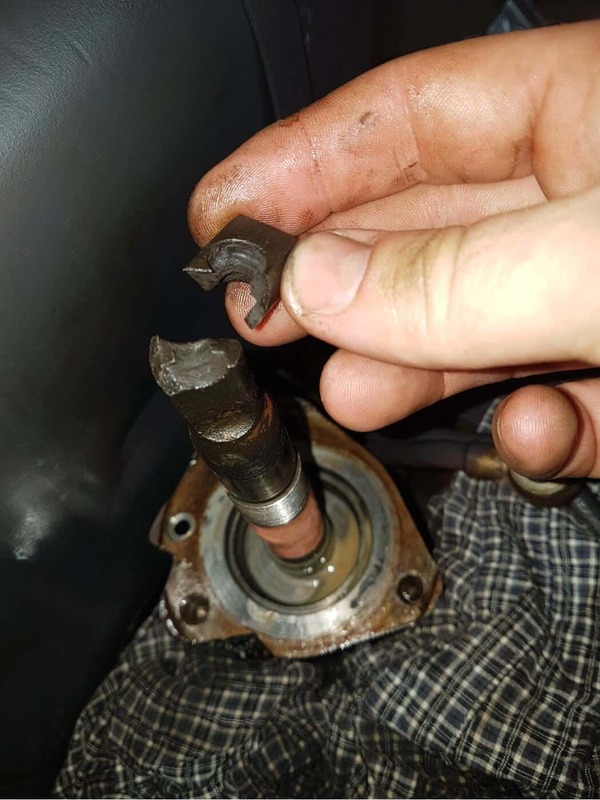 A look at the parts tear down showed me that welding to this shaft was likely to be an issue, as it had rubber seals o-rings on the internal worm gear portion. After talking over options with several friends, we came up with the plan to drill a new hole in the shaft. There were a couple hurdles to this. First – the shaft is hardened. None of the drill bits I had could even scratch this material. 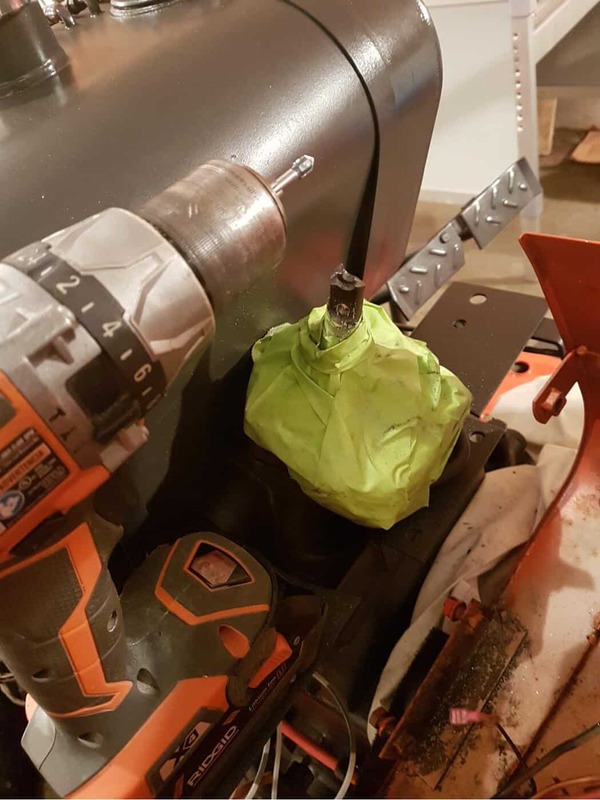 After researching online, I read first about ultra expensive carbide bits for hardened steel, and than about people using inexpensive carbide masonry bits the same way. I bought some carbide bits intended for glass and ceramics and they worked great! I had to remove the top cover to the power steering box for clearance so I taped it all up to keep the metal shavings out of the inside. I then went nice and slow with the smallest bit in the kit, and then stepped up progressively to the size I needed for my through-bolt. 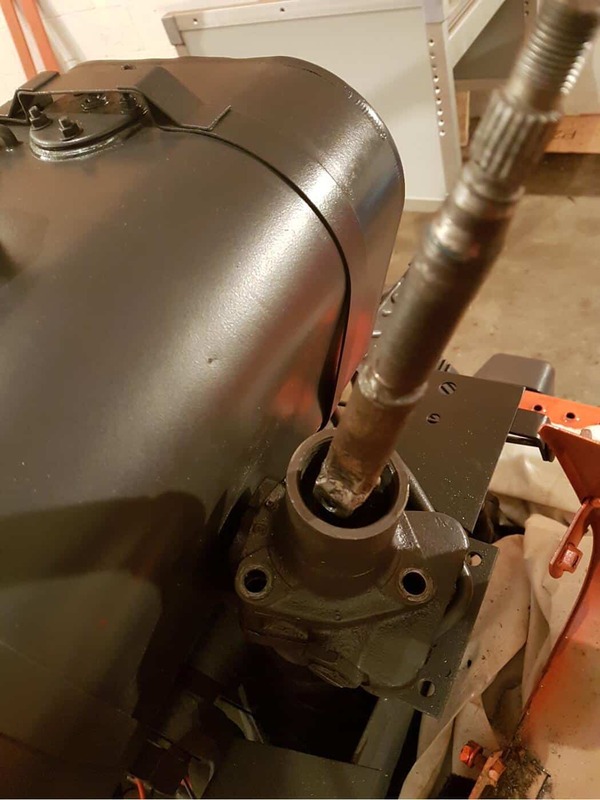 The second issue was that there wasn’t actually enough room on the upper steering shaft for the second hole. This wasn’t too big of a problem though. I just welded on some tabs / ears at the bottom to lengthen it, and then through holed that. This was plain old steel so the welding and drilling went uneventful. 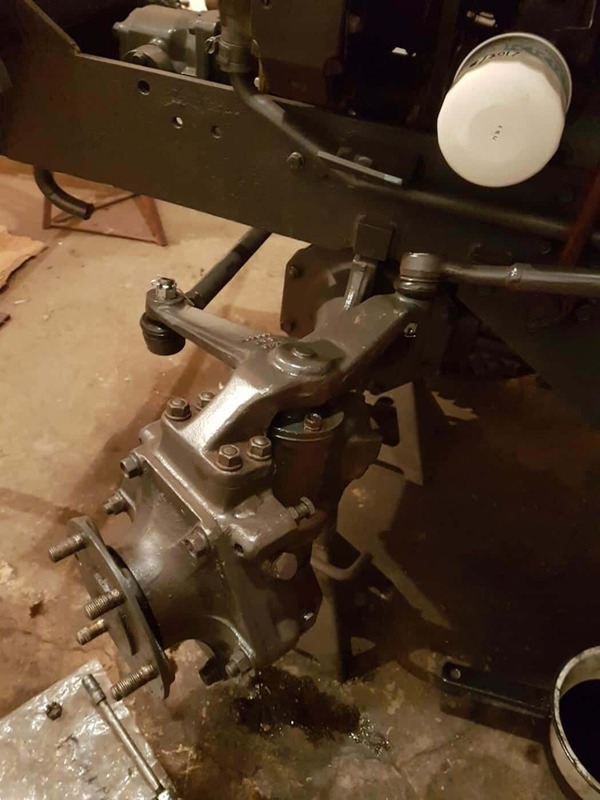 The last hurdle to the repair was that now that I had a hole in each piece, once the power steering box cover was installed there wasn’t enough room to install the bolt! One more hole needed, this time in the cast iron cover for installing the bolt. This one drilled very easy with standard bits as well! Now I just needed to thread the steering collumn cover back on over the repaired shaft and good to go! This reply was modified 1 year, 4 months ago by Mark. The front axle oil leak was in the swivel point for the left wheel. The bushings in the top knuckle support, which also supports this swivel, were very worn allowing the two sides to have a lot of free play. 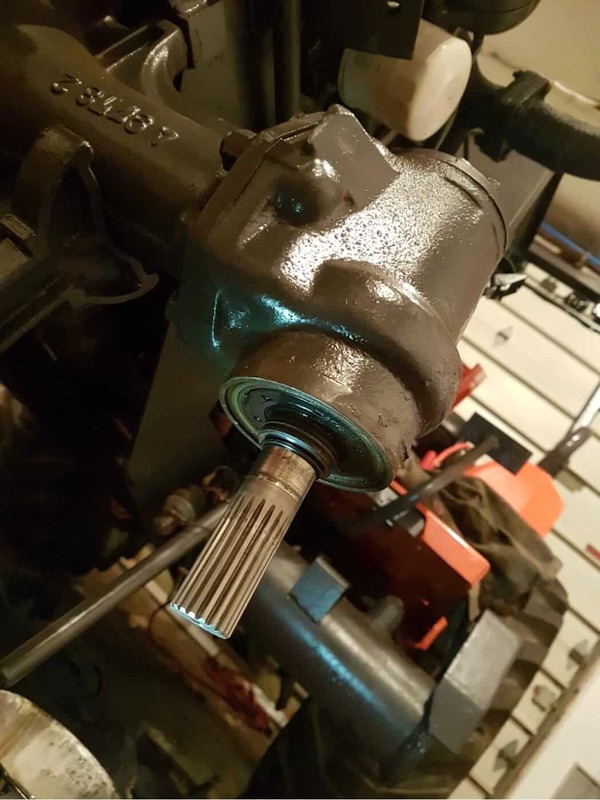 That movement combined with old dry-rotted oil seals resulted in a very fast oil leak! I separated the wheel hub gear case from the main axle. I chipped out the old brass bushing from the knuckle support and pressed in a new one. I then removed the two old oil seals. There is a seal in the hub gear case, and another one on the axle arm itself. The oil in the main axle is isolated from the oil in the hub / gear cases on each side. When changing / checking axle oil, make sure you check all three fill points! I used a trick I had read about for removing both seals since they were in blind holes. I carefully screwed a dry wall screw into the old seal, and then used large vice grips attached to the screw with a hammer to tap the seals out. I tapped the new seals in with a mallet and soft piece of wood to protect the new seals. 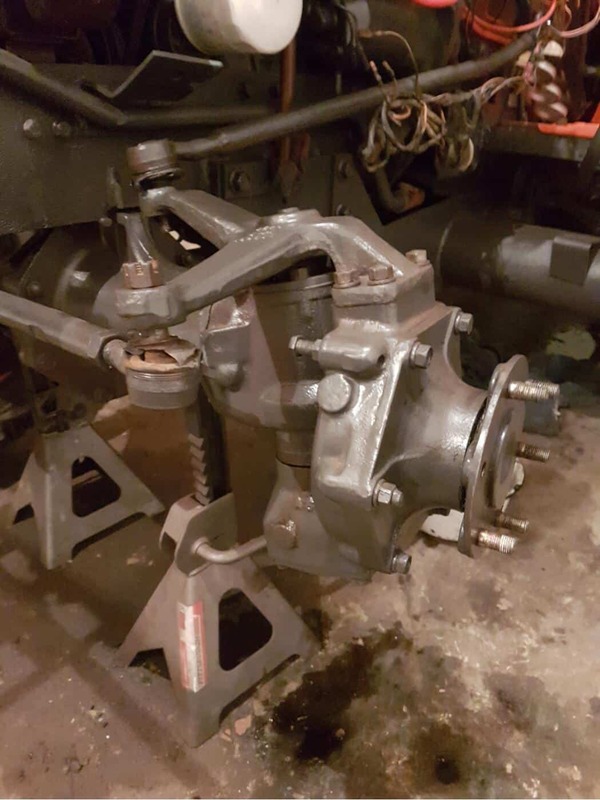 I also took the opportunity to replace the torn boots on all three ball joints on the front axle, packing them with fresh grease. Having one of those pop apart with a loaded bucket while on a hill does not sound like fun! And those sort of things have a knack for failing at the most inopportune time! Another video update! This was filmed a while ago but I just finally got around to editing it down. I also filmed the method I used to load the back tires with 48 gallons of windshield washer fluid. It was easy!! The tractor has been running great and has been coming in very handy the last several weeks.